It’s been said baseball is a game of inches. It’s also a game of execution. In a close game, it can mean the difference between winning and losing. Although the game in general is becoming more of a home run hitting contest, the “little things” still matter – especially at the developmental level. 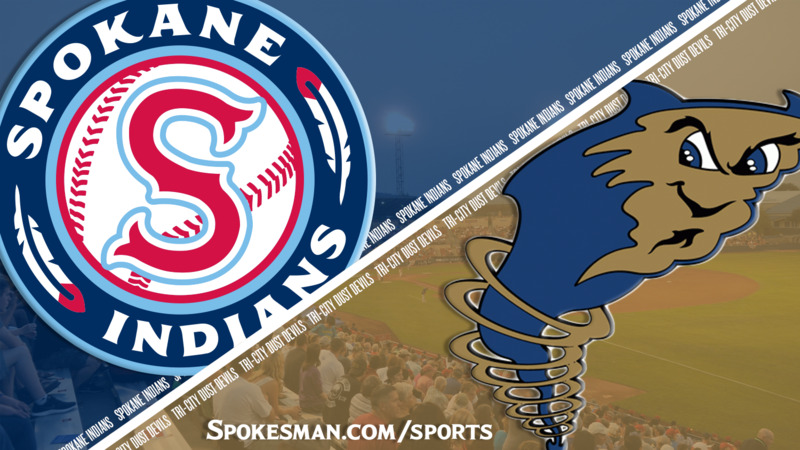 On Thursday, Spokane Indians third baseman Tyler Depreta-Johnson got a sacrifice bunt down in the bottom of the sixth inning when the opposition could not in the top half. That seemingly simple play led to the go-ahead run and a 3-1 win over the Tri-City Dust Devils in the second of a three-game Northwest League series at Avista Stadium. It was the second win in a row at home for the Indians (8-13) following a six-game losing streak, mostly on the road. Spokane starter Tai Tiedemann got into some hot water of his own making in the sixth, hitting the first two batters of the inning. Third-place hitter Aldemar Burgos, who entered on a 15-game hitting streak, was asked to sacrifice and couldn’t get the bunt down for the Dust Devils (9-12). Burgos ran the count full and eventually struck out. Tiedemann got Michael Curry to bounce into a 4-6-3 inning-ending double play to keep it 1-1. “When we got that ground-ball double play to get out of it – it’s just a moment I never really felt in junior college or pro ball so far,” Tiedemann said. J.P. Martinez, in a 4-for-20 skid with two earlier strikeouts, led off the bottom half of the inning with a running slap base hit to center. The speedster took second on an errant pickoff attempt and went to third on Depreta-Johnson’s successful sacrifice on a 0-1 count. “Whatever they call, I’ve got to get the job done,” the 35th-round draft pick said. Diosbel Arias lofted a fly to medium-deep right to Burgos. He made a strong throw, but Martinez sneaked past the tag and swiped the plate with his left hand without sliding for a 2-1 lead. Tiedemann came in searching for his first win of the season, coming off back-to-back losses on the road. He turned in his strongest performance of the season. The righty allowed one run on three hits and one walk with five strikeouts over 6 2/3 innings. Tiedemann’s roughest inning was his first. Grant Little and Owen Miller both dumped singles in front of center fielder Martinez, then both moved up on a wild pitch. Burgos bounced one to short for a fielder’s choice and Little scored, but Diosbel Arias made a heads-up play to nab Miller trying to advance to third. Tiedemann (1-2) came back to get a groundout and struck out catcher Blake Hunt looking to end the inning. The Indians’ bats took a while to get going. Tri-City starter Cole Bellinger, the brother of Dodgers first baseman Cody Bellinger, gave up his first run before his first hit. Cristian Inoa led off the third with a routine grounder to third – which went right between the wickets of Kelvin Alarcon and into the left-field corner. Inoa pulled into second with a two-base error. He went to third on a wild pitch and scored on Scott Kapers’ ground out to short. He retired seven in a row at one point and made it through the fifth allowing just three hits, a walk and one hit batter. After the walk in the fifth, he caught Alarcon leaning the wrong way for the final out of the frame. “That’s notoriously what starters do,” Holmberg said. “They don’t go out early and have their best stuff, best feel, best command. But as they go along they tend to settle in. “The good ones, you’ve got to get them early and they didn’t get (Tiedemann) tonight. Inoa finally came through with the Indians’ first hit in the bottom of the fifth, a one-out grounder to short that Miller double-clutched, allowing Inoa to beat it out. But Hasuan Viera and Kapers both struck out to quash any idea of a rally. Tiedemann got the first two outs of the seventh but after an error at first, Holmberg went to the pen. “That’s just been a key for me this year. Get my confidence built up, and I didn’t let that first inning affect me,” Tiedemann said. The Indians picked up an insurance run in the seventh. Gardner led off with a walk, went to second on a groundout and scored on Inoa’s booming double to the right-field wall. Burgos flied out in the eight to go 0 for 4 and end his hitting streak. He had at least one hit in every game he had played this season. Francisco Villegas provided 1 1/3 innings of scoreless relief and Cole Uvila earned his first save of the season, striking out two in the ninth. Published: July 5, 2018, 9:09 p.m. Updated: July 5, 2018, 10:11 p.m.